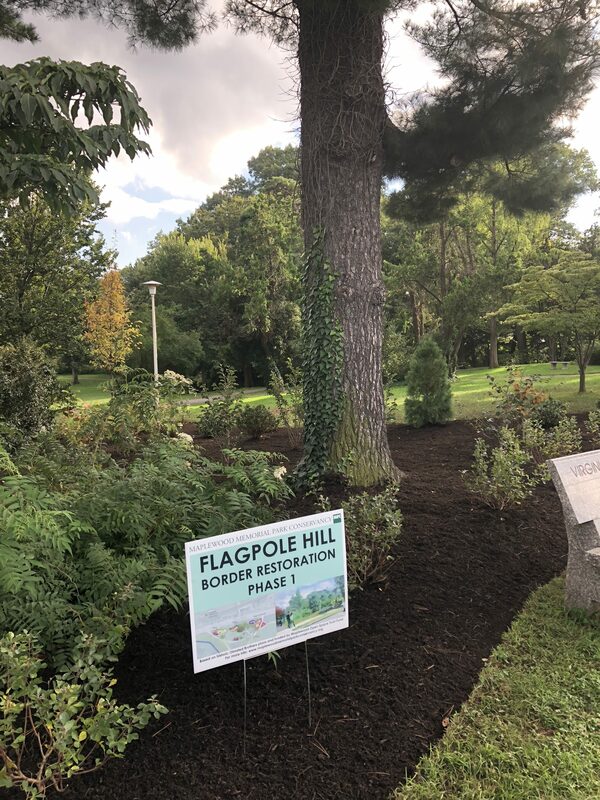 Phase 1 of our first major landscape project, the Flagpole Hill border restoration, is now complete! It is a beautiful addition to the park, and we are celebrating at a ribbon cutting ceremony on Saturday, November 17 at noon, across from the train station on Dunnell Road. Come out to see the new plantings, and preview plans for the remaining three phases, to be installed in spring 2019. Hot chocolate and cookies will be served. Flagpole Hill is an adaptation of an original 1923 plan for the border of the park along Dunnell Road, designed by the prestigious Olmsted Brothers landscape architecture firm. The current design was developed by Jennifer C. Ryan, Rutgers Landscape Architecture graduate intern, with the goal of creating a plan, appropriate to twenty-first century uses and climate, that remains true to the picturesque Olmsted vision. Beautifully planted beds of shrubs, trees, and ground cover allow views and circulation into the park and clarify entrances while providing shield from the roadway. Seasonal beauty, interest to wildlife, and adaptability to the site also guided the design. Flagpole Hill is generously funded by the Maplewood Open Space Trust Fund. It has been over a year in planning and approvals and has received the enthusiastic support of the Township and approval by the Historic Preservation Commission and the New Jersey Historic Preservation Office. Copyright © 2019 MAPLEWOOD MEMORIAL PARK CONSERVANCY – Powered by Customify.